On this episode so Relatively Prime Samuel talks with former office mate at UNLV Cody Palmer. When this conversation was recorded Cody was a PhD student at the University of Montana and has since moved on to become a Postdoctoral Research Scientist at the Institute for Disease Modeling. 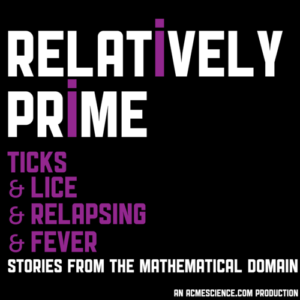 Samuel and Cody talk about the research Cody did into Tick-Borne Relapsing Fever and how the number of relapses effect its dynamics, plus some advice on burger toppings and the worst(or the best) research strategy to use when studying an infectious disease spread by biting insects. Don’t forget to support Relatively Prime on Patreon and help Samuel survive the month!